White wins by 8 points, komi 7. This is the fourth game on the road to 2 dan. At the time of this writing, Black is 3 dan (R1871), which might be his actual rank. is a contemporary opening, popularized by Go Seigen. It is ready to create outside influence if Black is attacked at . is a mirror reply, just to create the most balance shape. is an early attack. Normally weak players avoid it because their strategies are territory-oriented. Strong players, on the other hand, have adaptive strategy. 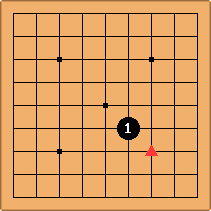 They decide the next move by the opponent's camp, not by the free land available. is to claim the left region. 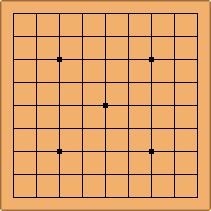 Whole board thinking shows White is physically inferior, but the big komi makes them actually balance. After , Black seems to occupy the large north east region. And, is being attacked. I want to help it and, to be efficient, must attack Black at the same time. This is double-purposes strategy. So, I hane with , which aims at . 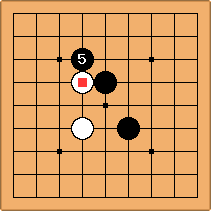 Black has to choose between S and T.
Black pushes with . He expects White to fill at and then he will seal at , which will ascertain the large territory is his. 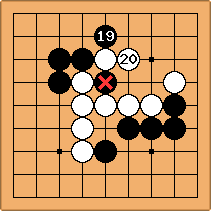 White cuts with rather than filling at , which surprises Black. Now the black army is divided into two units. is hard hit and needs help. is natural; otherwise, will get killed. It seems like White is being squeezed and needs to fight both sides at the same time. is somewhat receptive, but it creates weak points of Black, at . It also unites the white army, forming a Berlin wall that influences both sectors of Black. 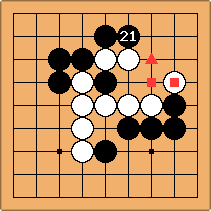 Black though the weak points are too many, so he put . affects directly and indirectly. 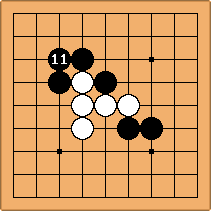 White now forms a great wall, hard to kill. 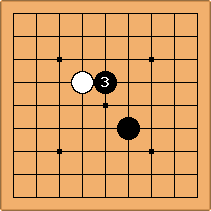 Black's most urgent task is to help the two . The question is how? He has to surround enough space, in correct form, in order to live. He begins with . The purpose of and is to widen the base, a basic strategy for survival. The purpose of and , on the other hand, is to squeeze or confine Black, in order to make Black live in hardship. 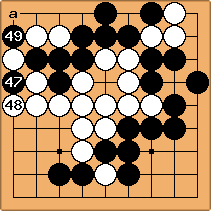 The fighting until not only affects Black's bottom group, but also influences Black's top left group. is not as small as it seems. Imagine what will happen if Black can jump freely with . is a must unless there is somewhere bigger to play. is simply to escape while almost killing . 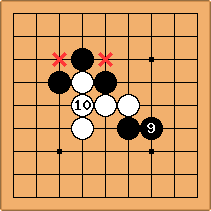 Black enjoys tracking with . 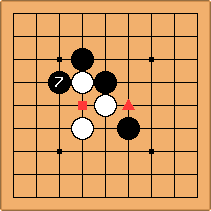 To here, Black seems to occupy the large two corners, whereas White is being squeezed. White needs to create a big turning point in order to win. This is called "Believe in your dreams and making them reality." Black wants to hane at and then in order to kill . If allowed to happen, this battle would lead Black to victory. 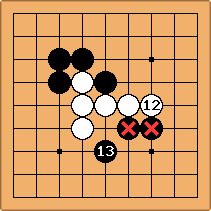 Therefore, White should do some big attack before. Big attack means an attack that could kill a big group or cause a vast territory damage to the enemy. is big. If ignored, it is a basis for white jumping to , and will possibly kill this black group. Black wants to arrest at . Beginners will defend at , but stronger players don't. A better reply is to fight back at . 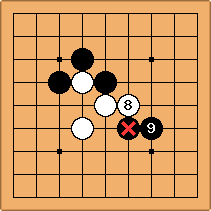 For more annotation (from to here), see The Art of 9x9 Go. 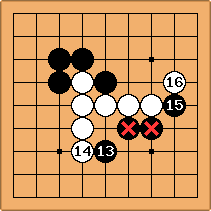 At the end, White (the author) wins by 8 points.